I’ve been trying to write this post for a good 20 minutes and it’s been so hard. Because I have no words. These St. Patrick’s Day Rainbow Snack Cups are THE CUTEST! 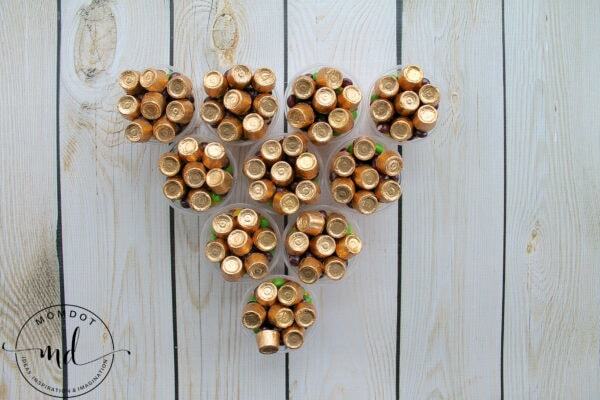 I am telling you they are seriously one of my most favorite St. Patrick’s Day holiday crafts ever. Don’t you just love them? I honestly don’t even know what else to say about them because I feel like my words won’t do them justice. But I’ll try to name just a few reasons why these snack cups are so great. First of all, they are just so fun! I love that there’s no mess! Seriously, that right there gives them an A+ in my book. These St. Patrick’s Day Rainbow Snack Cups come together so quickly. You could easily make 10 snack cups (with kids helping) in under 20 minutes. Speaking of kids helping, they’ll have a great time. Sorting the colors is a great activity for children. Seriously, even my 7 and 9-year-olds love it. Who am I kidding? I love it too! Use this as a learning activity about colors, rainbows, even clouds! With Skittles, Rolos, and marshmallows, there’s sure to be something everyone will love! And finally, they’re actually pretty inexpensive to make. I’ll be breaking the cost down in the instructions below, but who can argue with cute AND cheap? So, I guess it turns out I was able to say more than I thought, but I think I’ve rambled on enough, so let’s get on to the crafting! First, gather your materials. I’ll list them along with the cost so you can see the breakdown. Second, separate and group the Skittles together by color. Third, lay out ten plastic cups and add marshmallows in a single layer on the bottom. Fourth, add a single layer of red skittles on top of the white marshmallows. Add, orange on top of the red. Continue with yellow, green, and purple. Then, add the Rolos as the last layer. They’ll be slightly higher than the rim of the cup, but that’s totally ok. 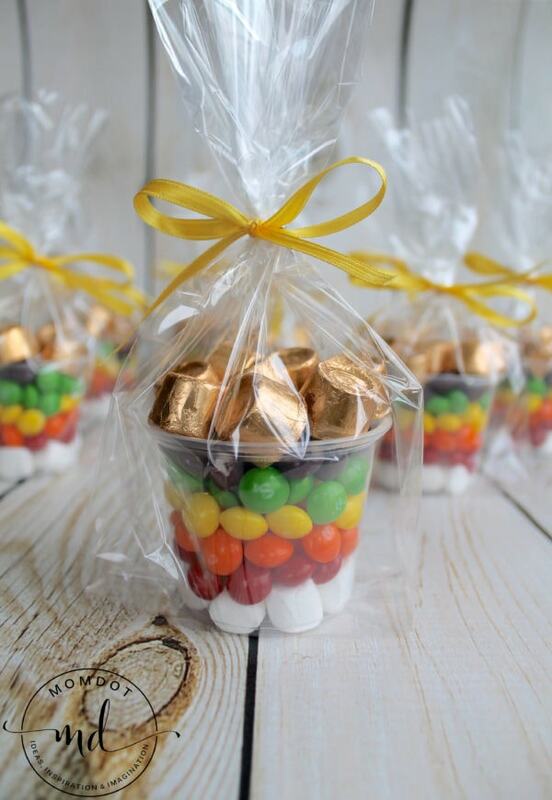 Finally, place the cups inside the treat bags and tie off with the ribbon. Isn’t that just so simple? And did I mention how awesomely cute they are? These St. Patrick’s Day Rainbow Snack cups are just such a fun project. I can’t wait for you to make them. Let me know in the comments below what you think. And as always, if you post your creation tag us in it. We love seeing what you make!